I’m proud of this blog and have poured my heart and soul into it since 2010. It’s been my passion, for sure. For that reason, because I truly believe in the value I’ve added from content on this site, I use affiliate links & other partnerships on this website to try and compensate myself for the time and hard work I put into it. When you click on links and make a purchase, this site may receive a small commission (like I could probably make more opening up a lemonade stand) — at no extra cost to you! I always so appreciate when you shop through these links. I am also an affiliate for Shopstyle — a program that pays me a small commission every time a reader clicks a link. At times I may receive books or products for review consideration or as a gift. When this happens I will specifically disclose in the post that I have received it for review consideration or as a gift by saying “c/o or courtesy of.” This NEVER sways my opinion or what I write about the product in question…pinky swear!! I have written very honest reviews of things I don’t like or point out the cons of something I did like if there were any. I decided what I want to review (honestly there is lots of stuff that never ends up even on this blog even though I’m thankful for it) and pride myself in my honesty. I super hate when bloggers aren’t honest about this kind of stuff so it’s important for me to be honest — no matter if that means I’m never sent something for free again! I NEVER EVER accept monetary payment FOR a review. Nope, not interested in paid reviews. Any paid-for-posts or sponsorships will be specifically and clearly marked as “sponsored” in a disclosure at the top of the post. I only accept sponsorships/partnerships for things I truly like or believe in or am genuinely interested in. Not into selling my soul in hopes of making a quick buck. If it’s a good fit and I think my readers would be interested in it, then I’m in. Unless noted, I don’t get paid by anyone to feature any product or specific company/brand — it’s just genuinely the things I like, am interested in, etc. Also, if you ever have any questions about my disclosure policy, never hesitate to contact me! Top Ten Books Everyone Has Read…Except Me! 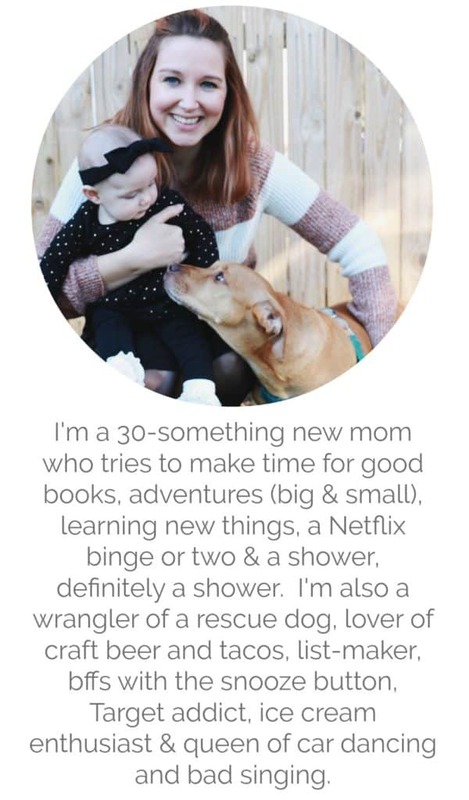 Jamie is a 32 year old married lady (with a new baby!!) who is in denial that she's actually that old to be a married lady and a mom. When she's not reading you can find her doing Pilates followed by eating ice cream, belting out Hamilton (loud and offkey) and having adventures with her husband, daughter and rescue dog.